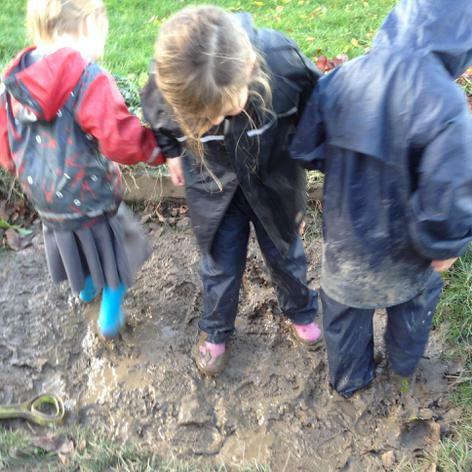 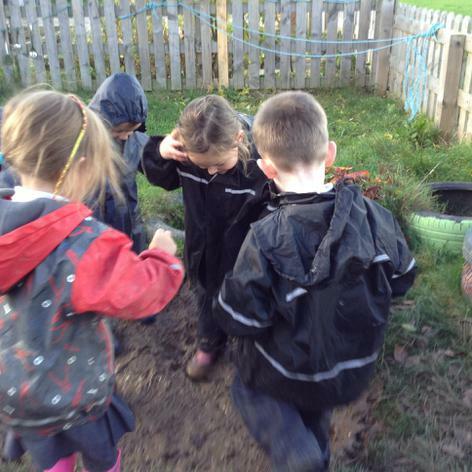 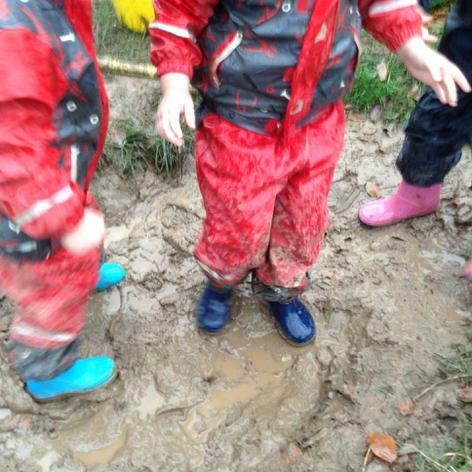 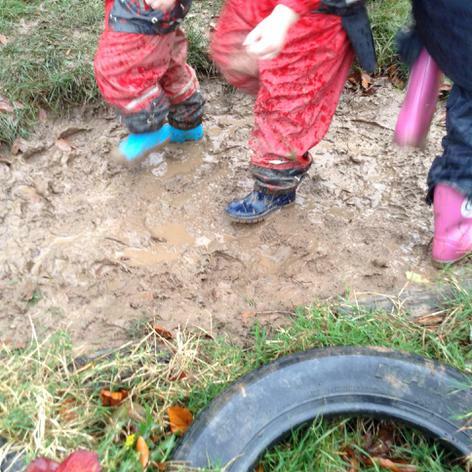 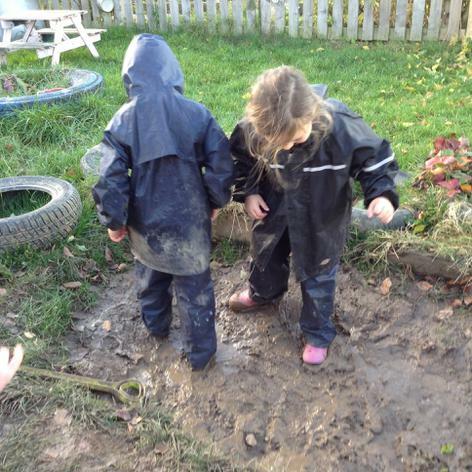 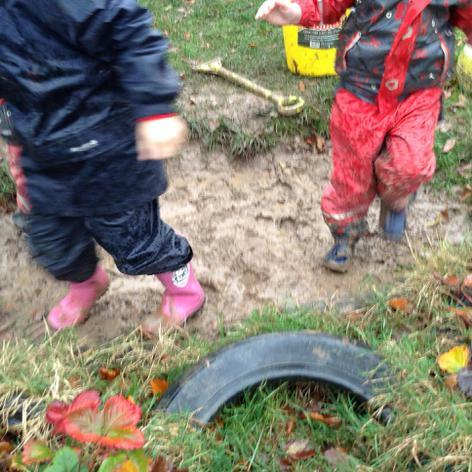 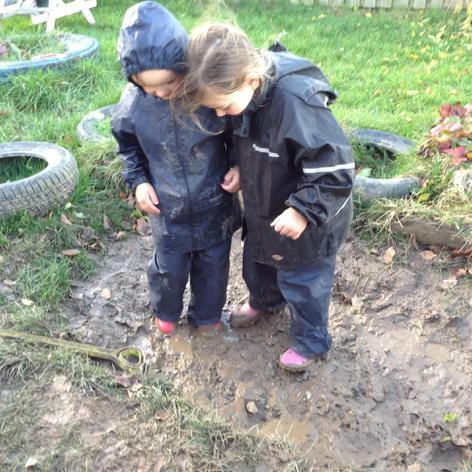 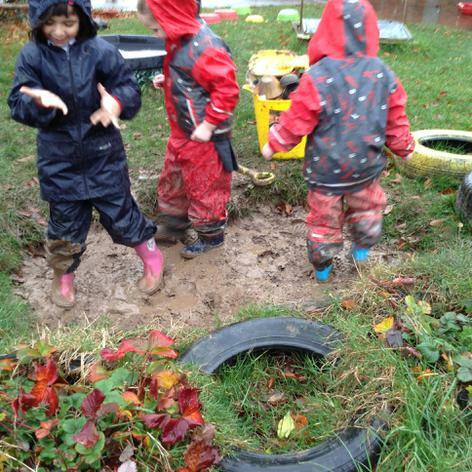 We have had great fun making tracks in the very wet, sloppy mud. 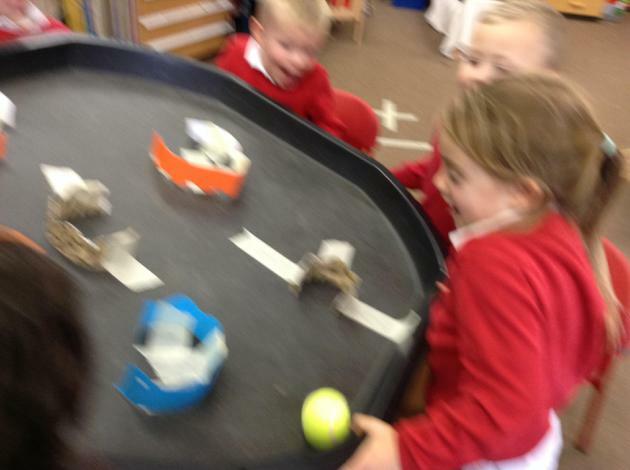 It made such funny noises when we plodded around in it. 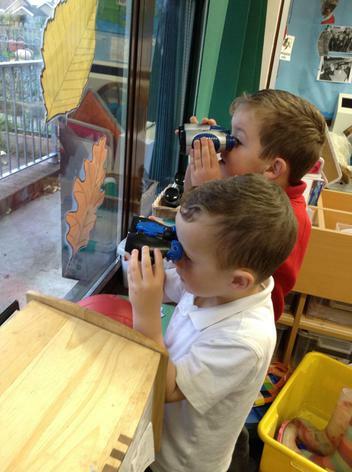 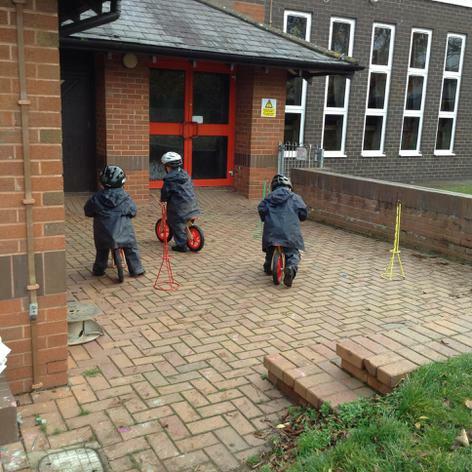 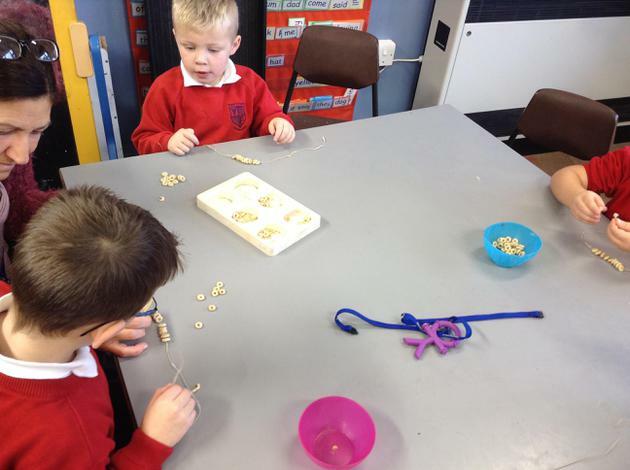 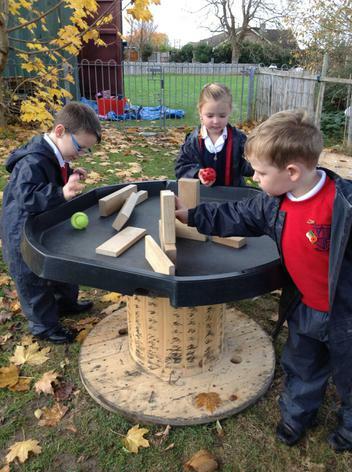 Also outside we have been: using our eyes to help us avoid obstacles on the balance bikes, playing skittles, frantically trying to get a ball in a goal on the big play trays and hanging out bird feeders made with breakfast cereal. 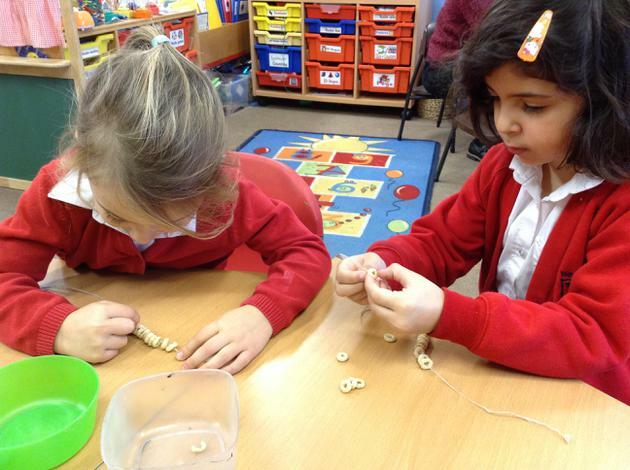 ( We counted 20 little whole-wheat Os on to our string to make our feeder). 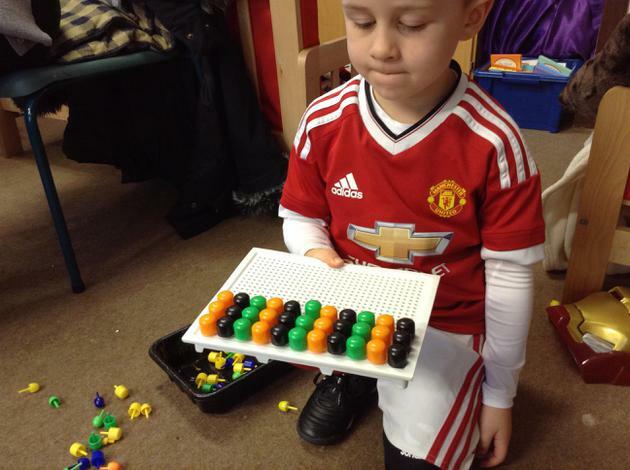 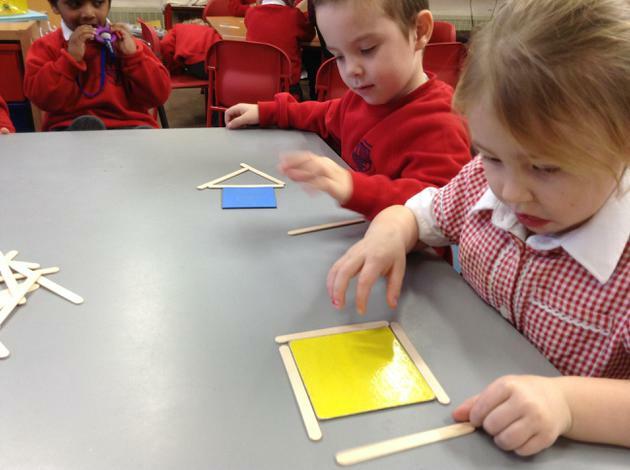 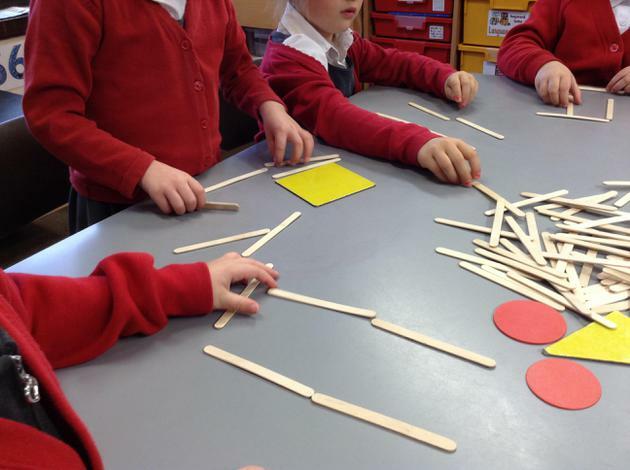 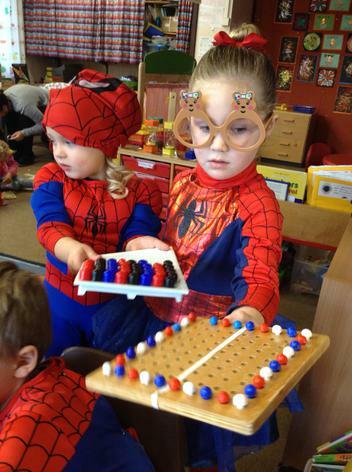 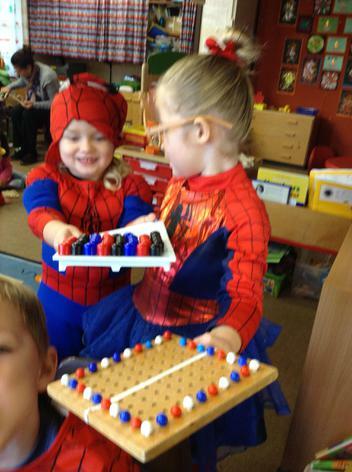 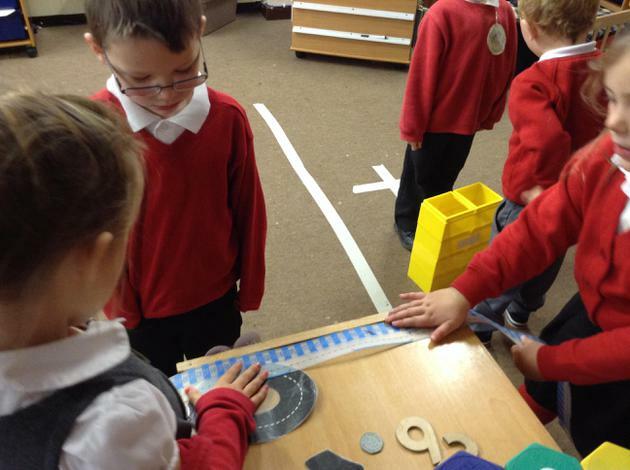 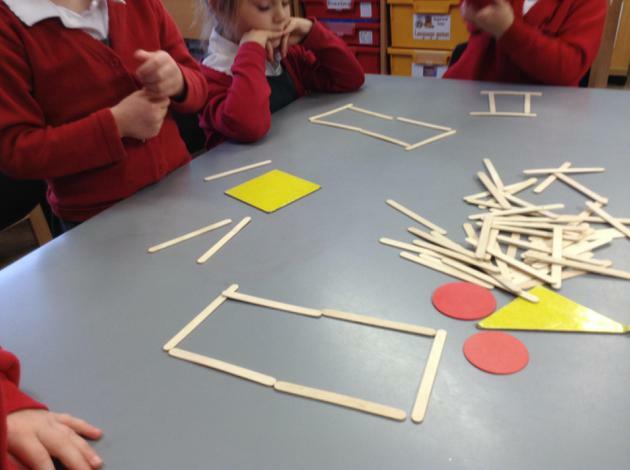 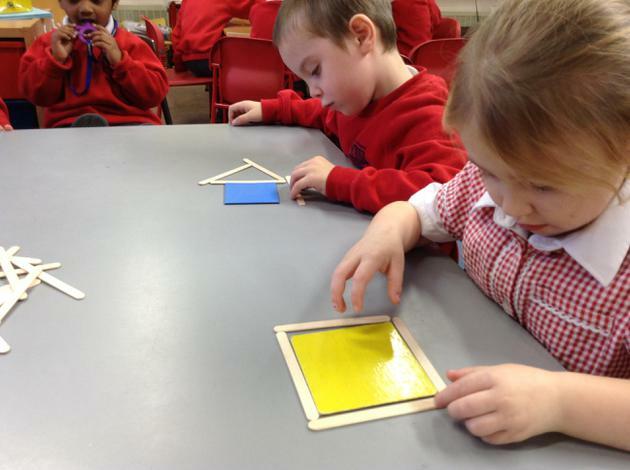 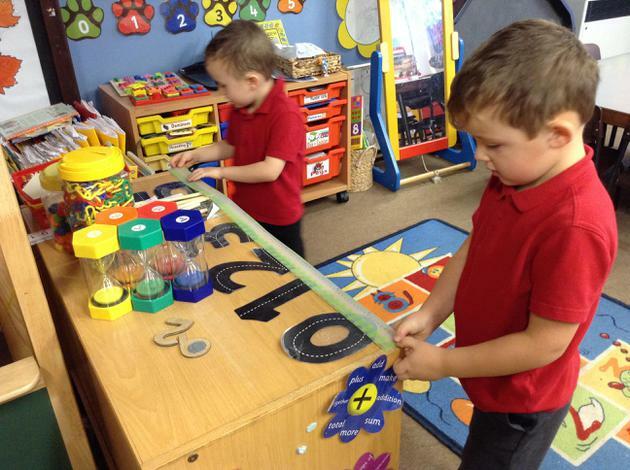 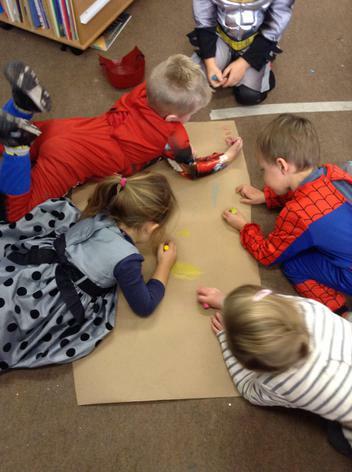 One morning we made fabulous patterns with three colours on our peg boards. 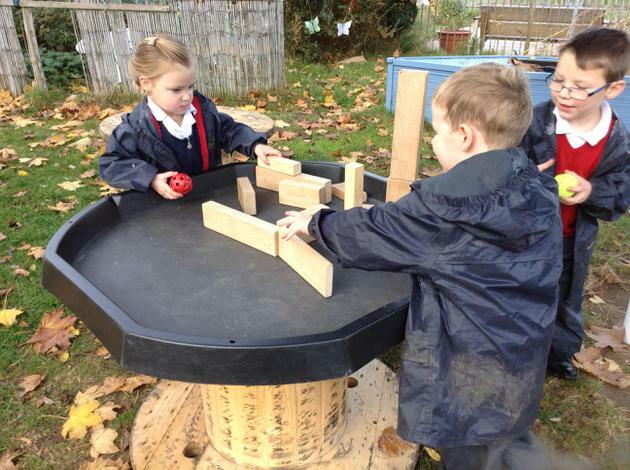 It took a lot of concentration but we all managed it. 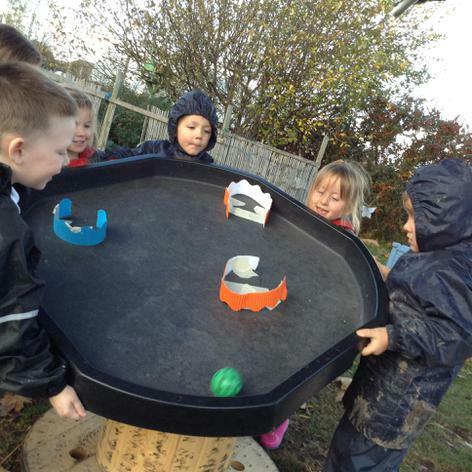 We've had loads of fun with ice- it's slippy, hard and cold- and it's made from water! 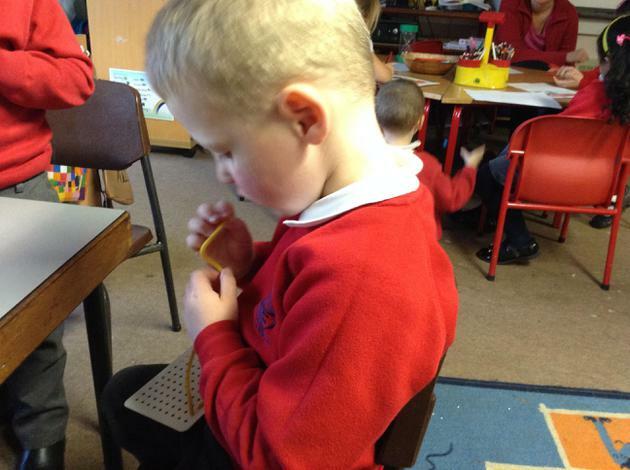 If you hold it, it will start to turn back into water. 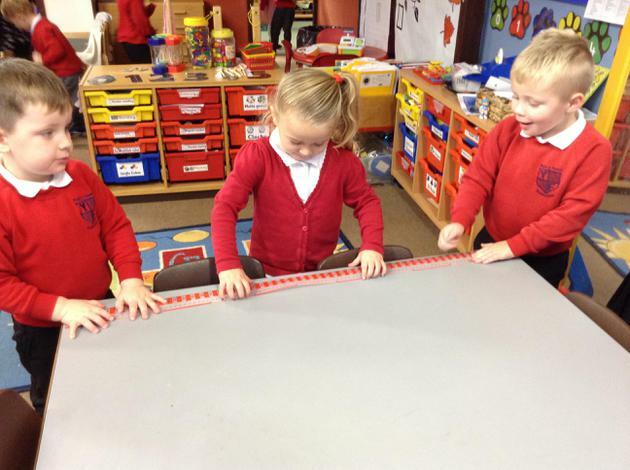 It not a magic trick, it's just a natural thing that happens. 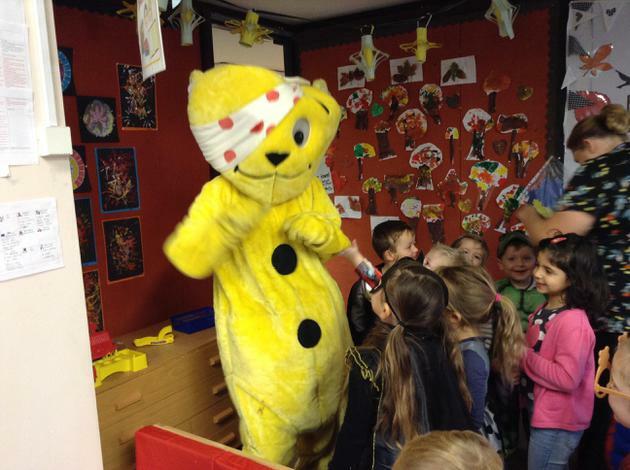 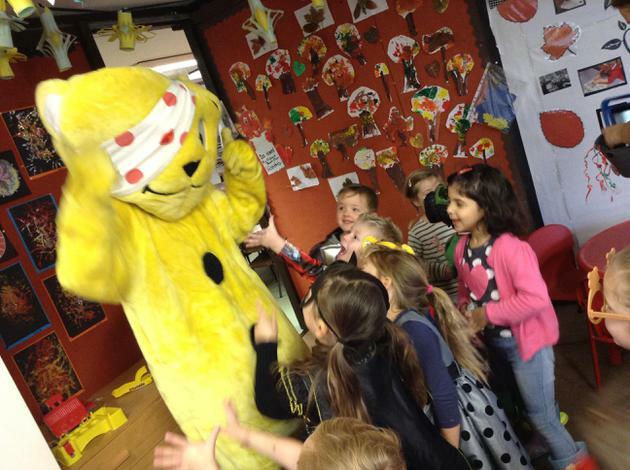 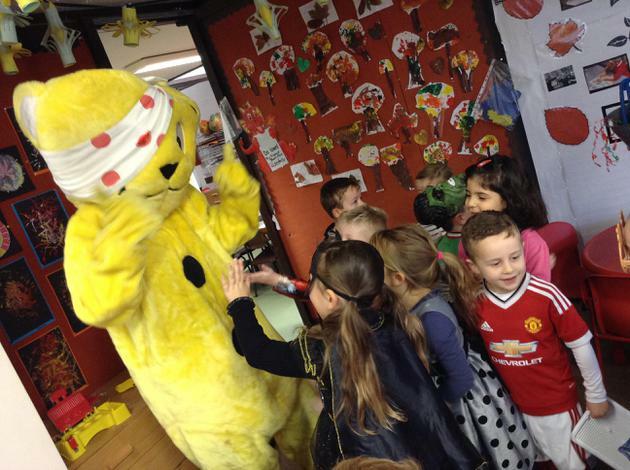 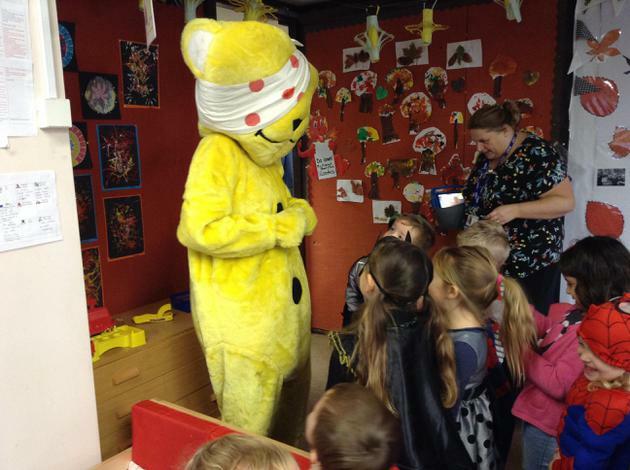 Pudsey came to see us for Children in Need and we were allowed to dress as our hero. 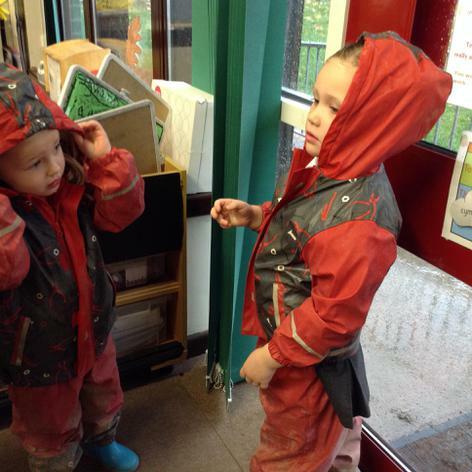 Most of us wore our own clothes. 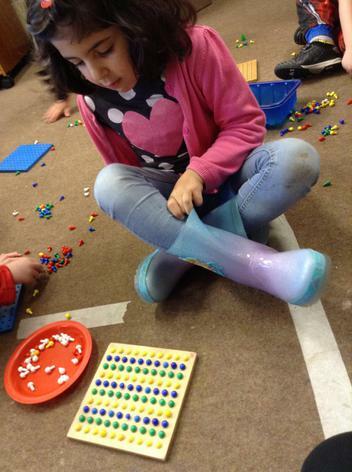 It turns out that there are lots of words for adding and taking away- we played a running game to help us learn all the different words. 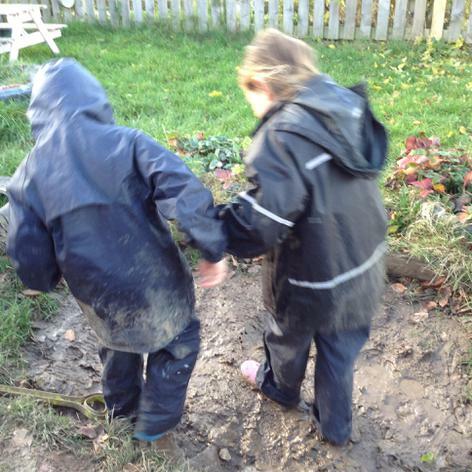 Some of us just ran about a lot. 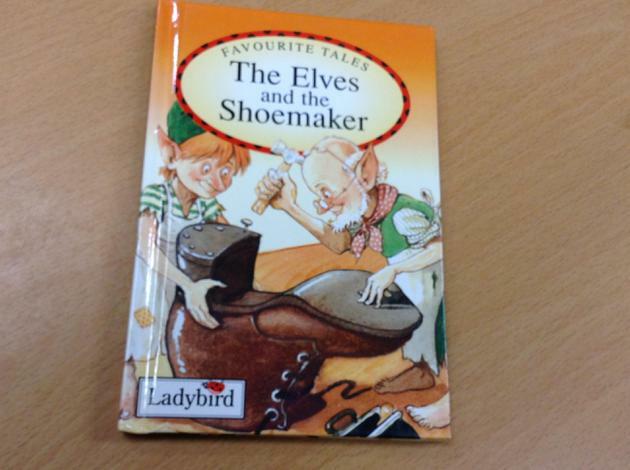 It was fun but hard to remember all the words. 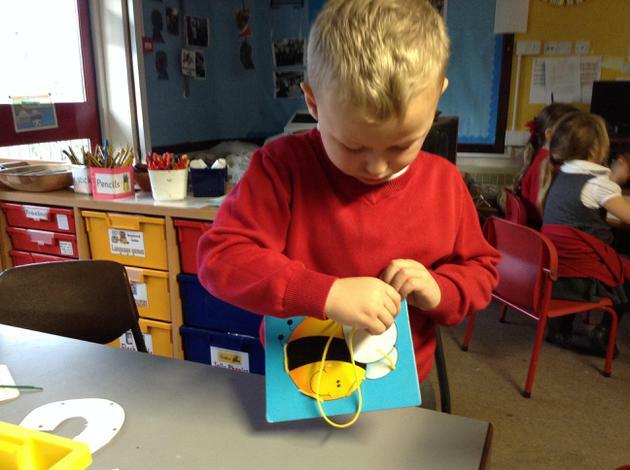 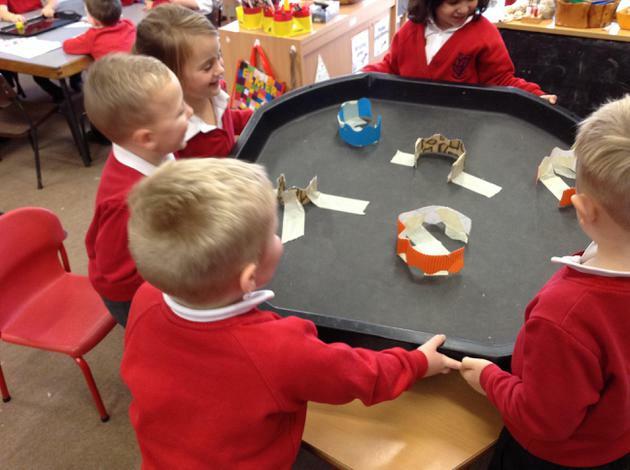 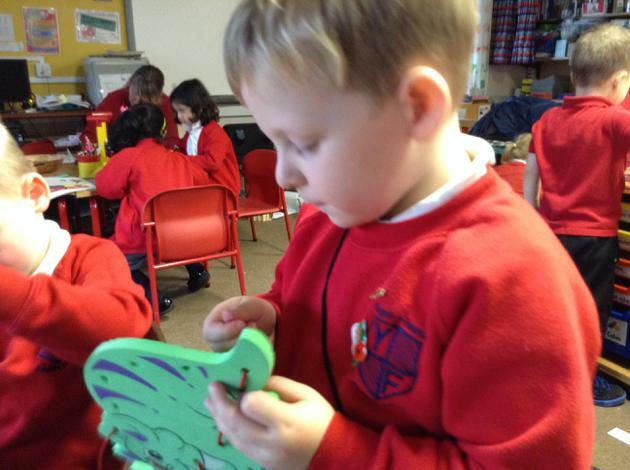 We have made bird models ( as well as bird feeders); we had to fold a piece of paper into a spring or concertina - it made us a bit cross until we managed to do it. 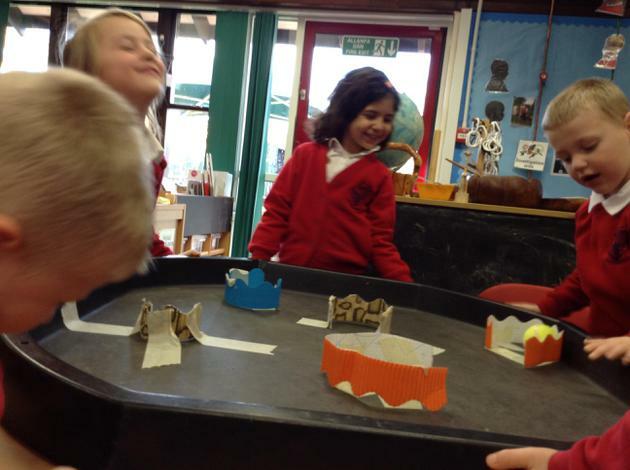 Some of us helped the others to turn and fold the paper. 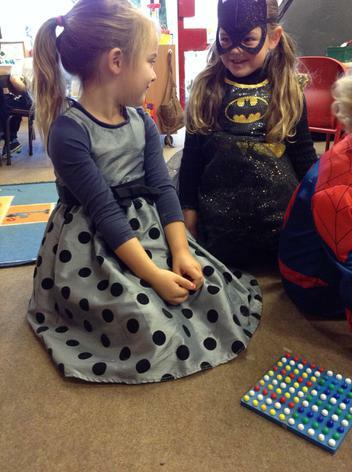 We felt fabulous when we were able to do it. 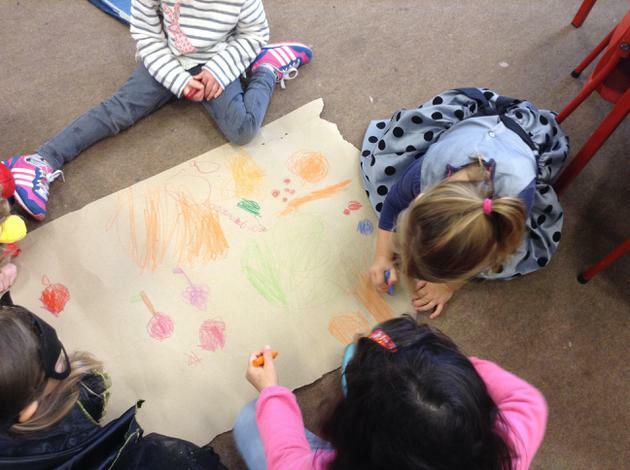 We are learning food names in our Welsh lessons and we ( Reception) drew a huge picture shopping list and named all the food in Welsh. 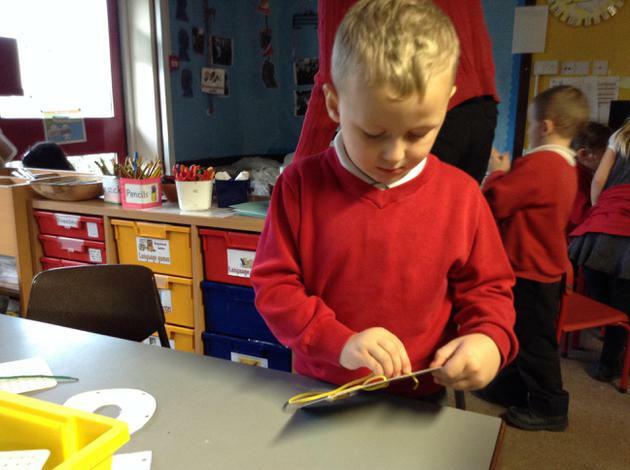 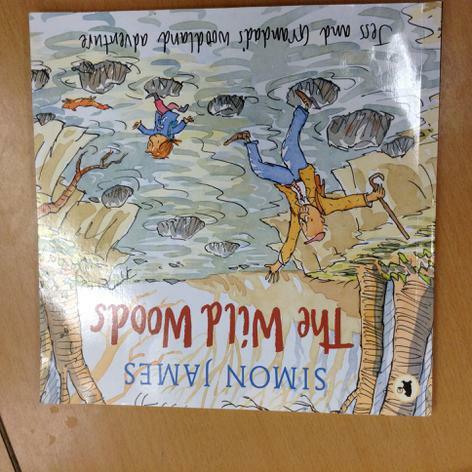 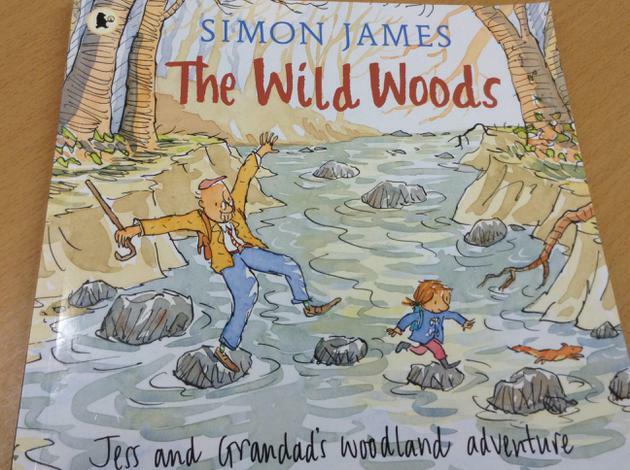 Lots of us are learning high frequency words and reading books at home too- we are a busy lot! 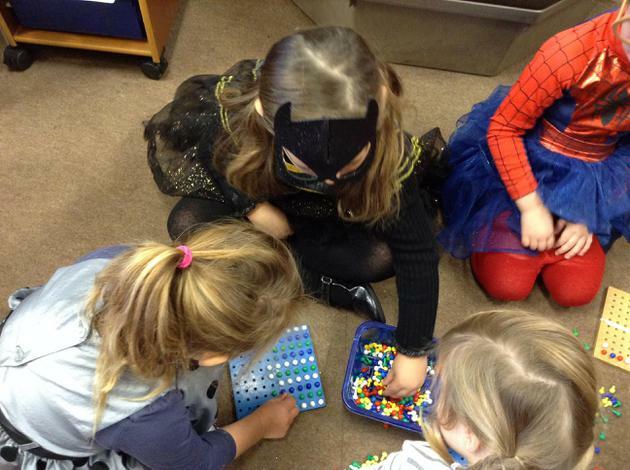 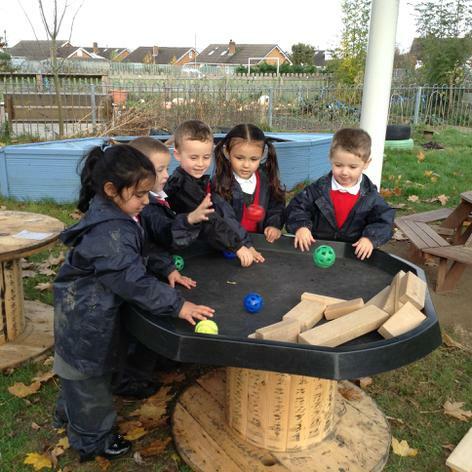 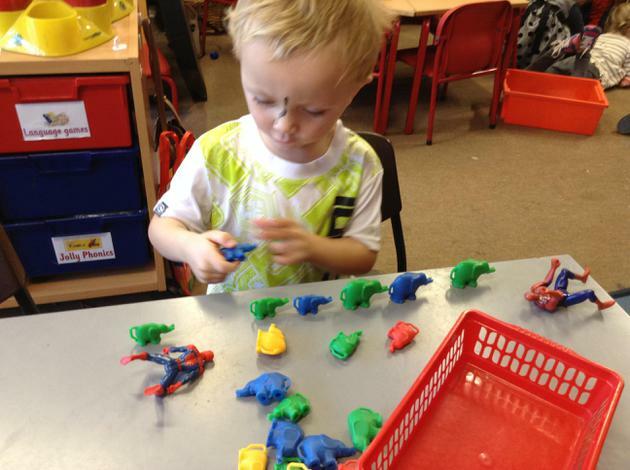 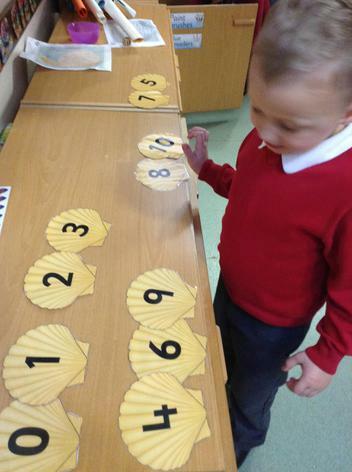 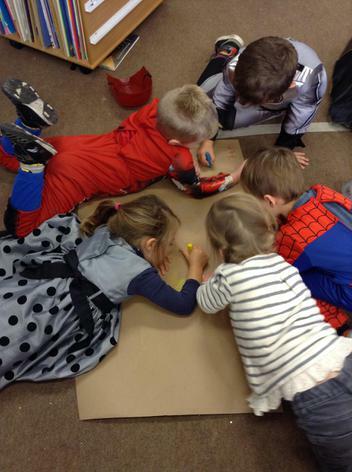 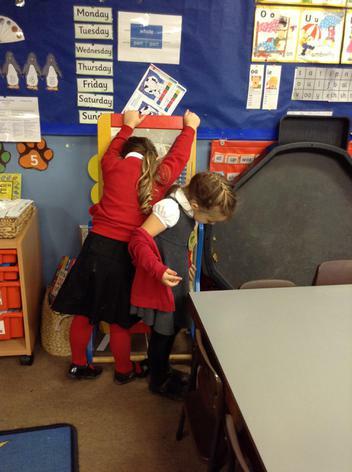 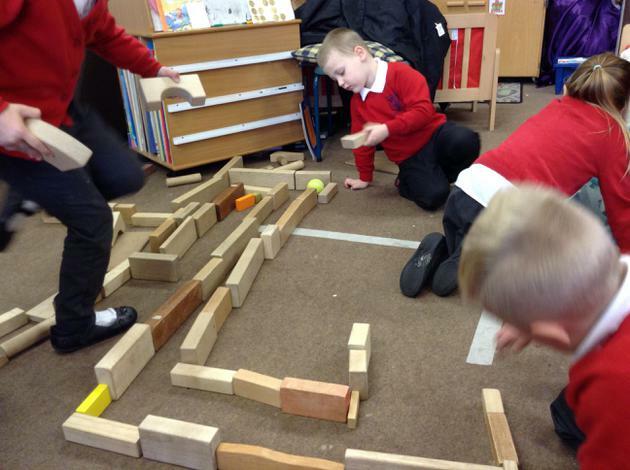 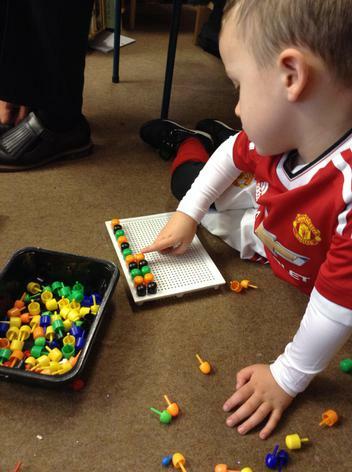 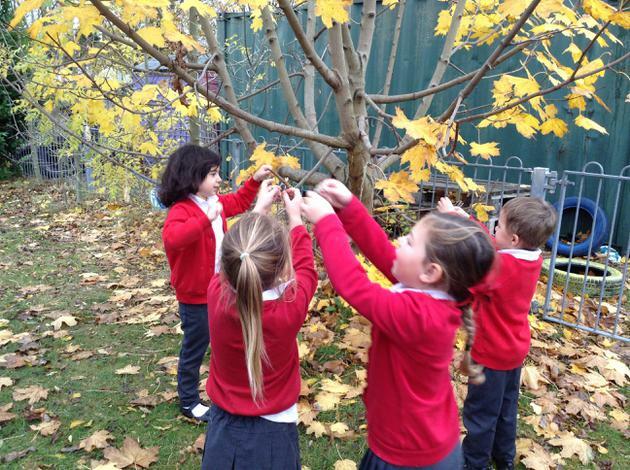 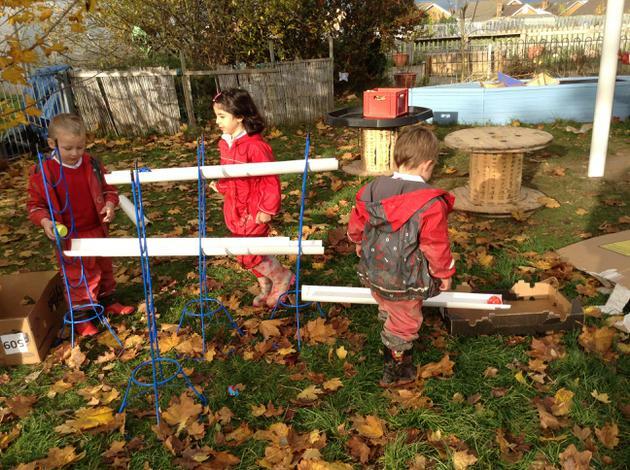 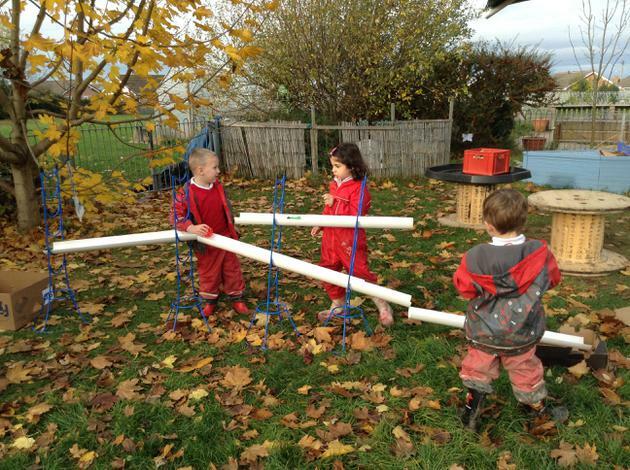 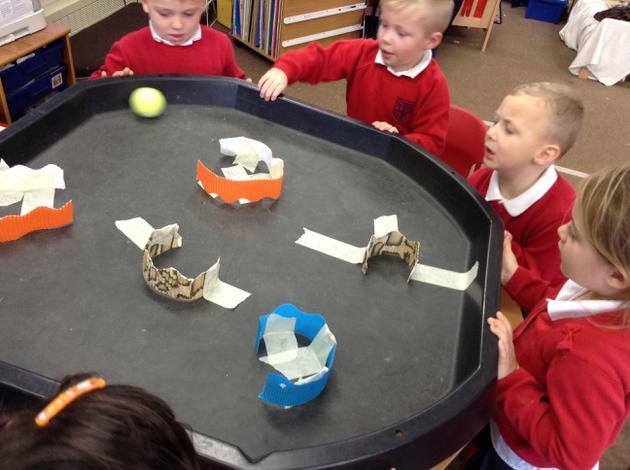 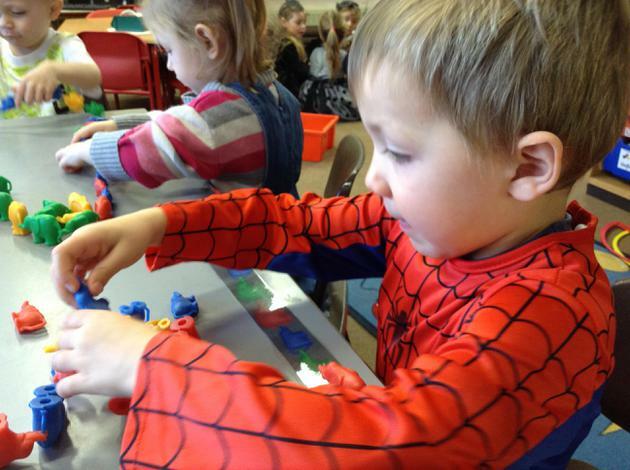 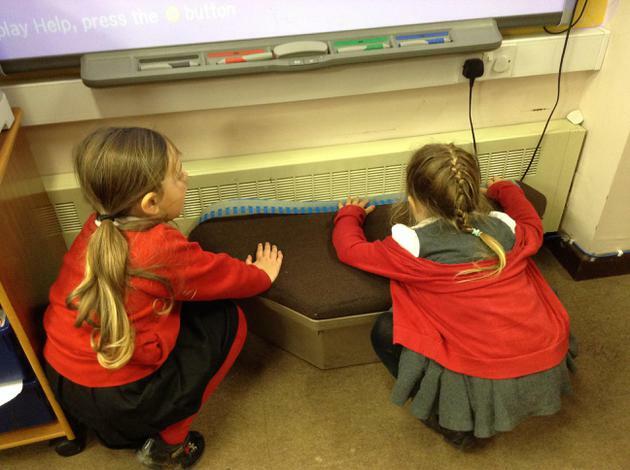 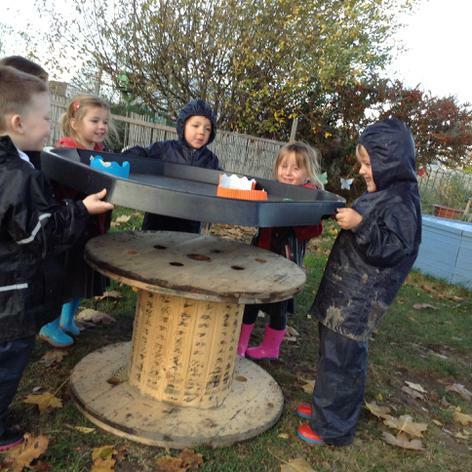 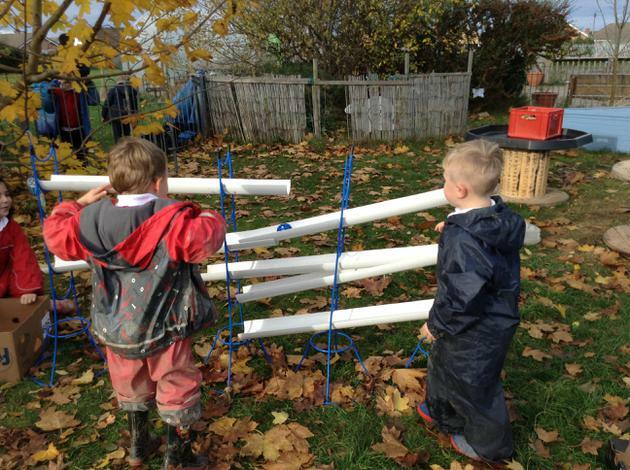 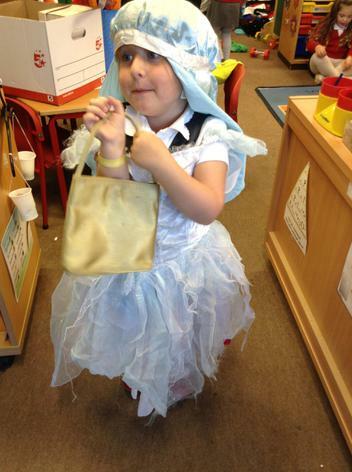 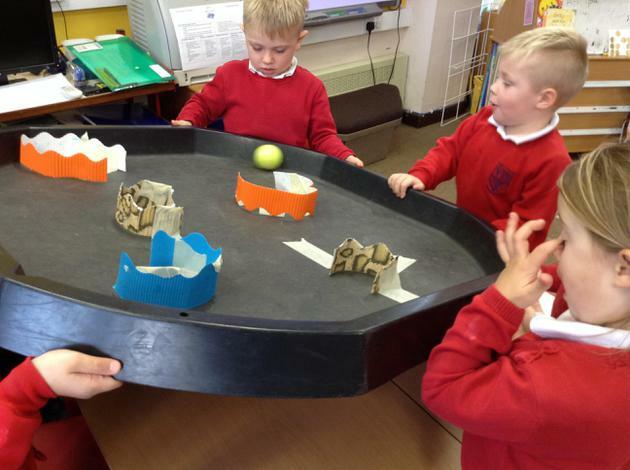 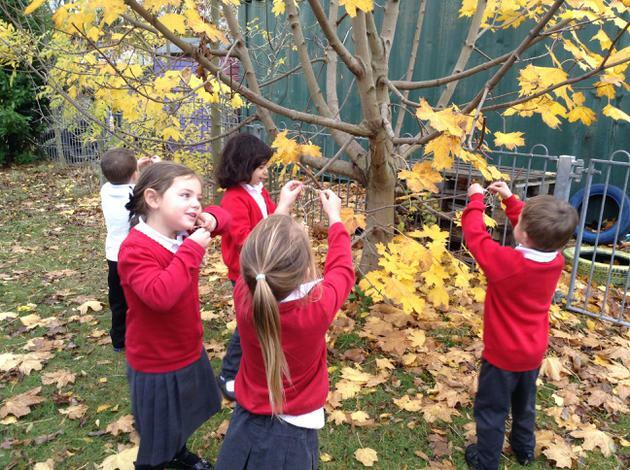 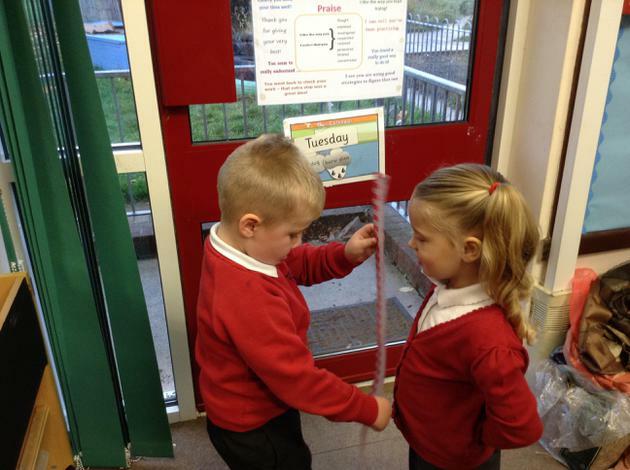 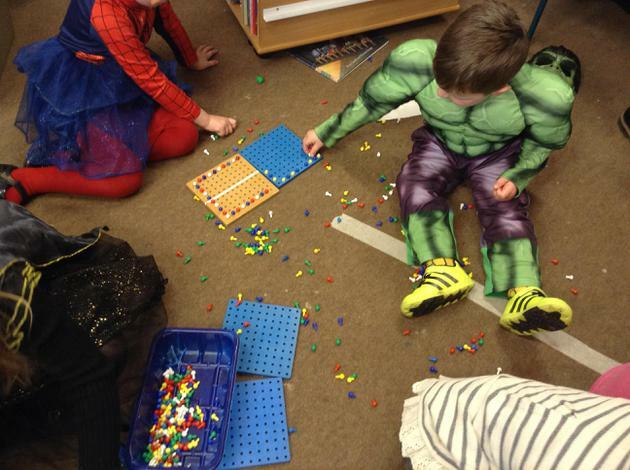 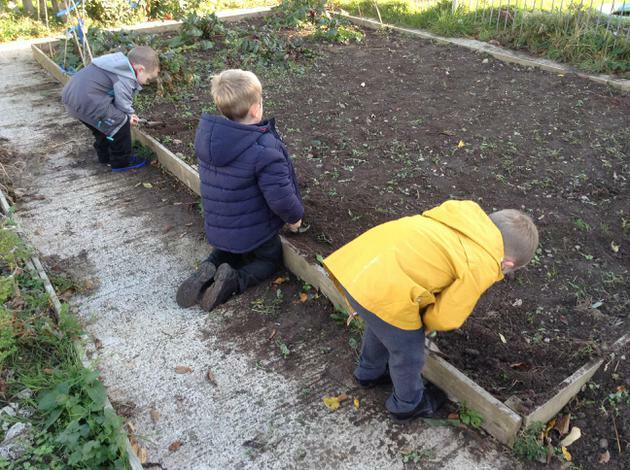 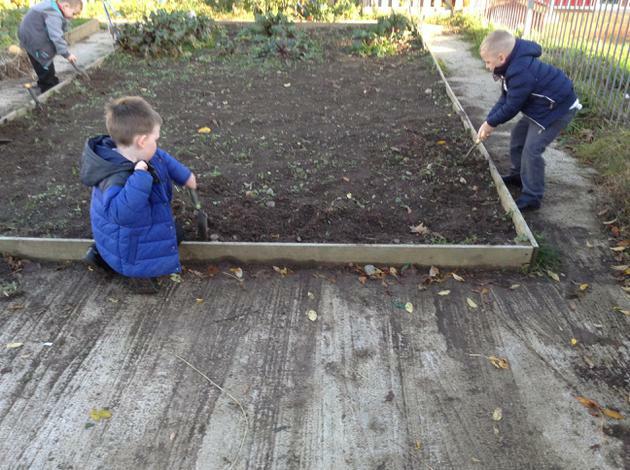 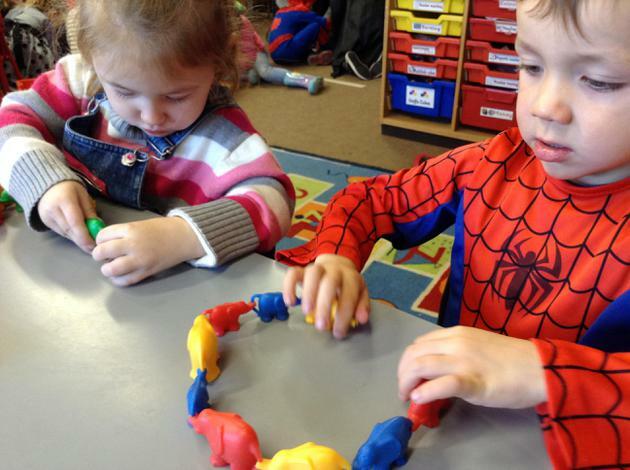 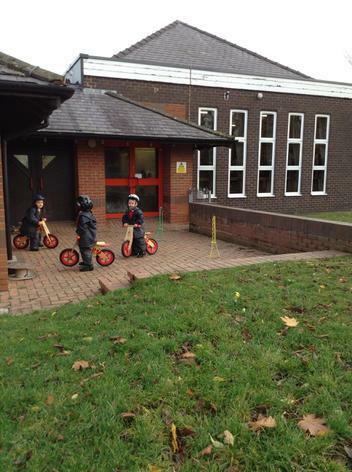 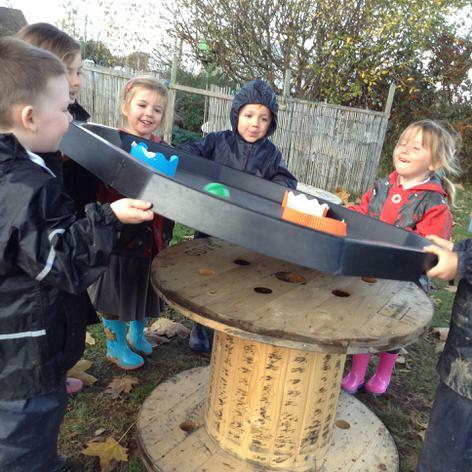 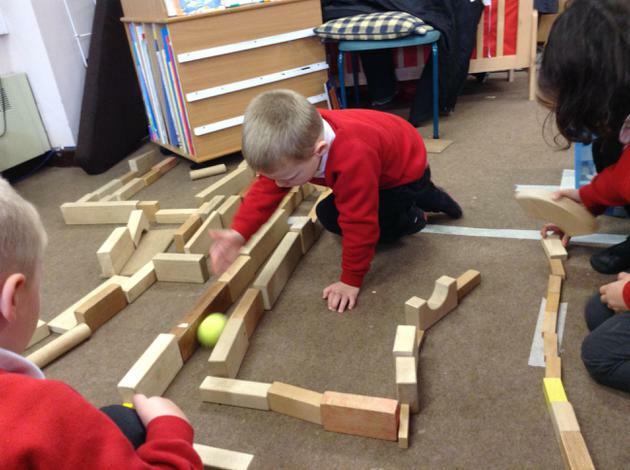 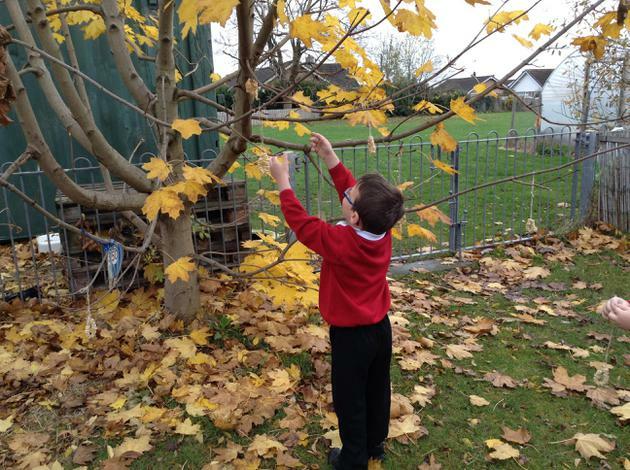 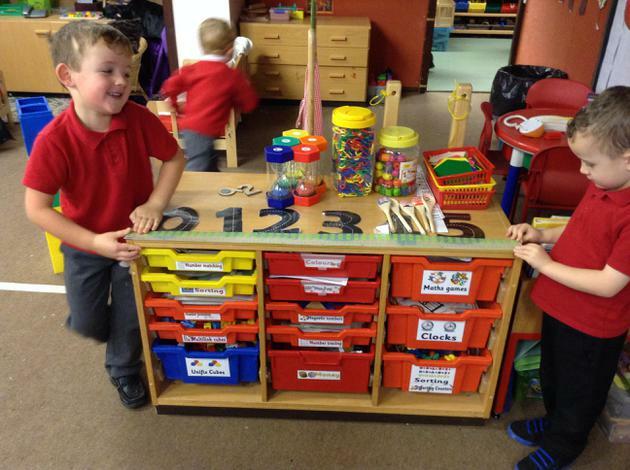 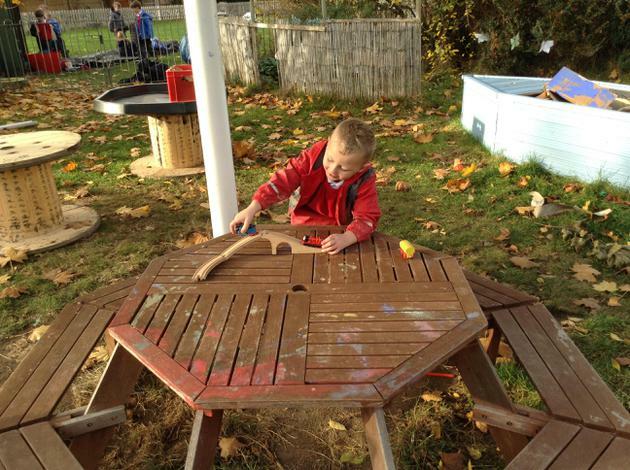 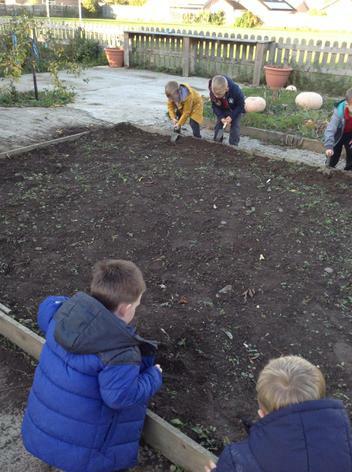 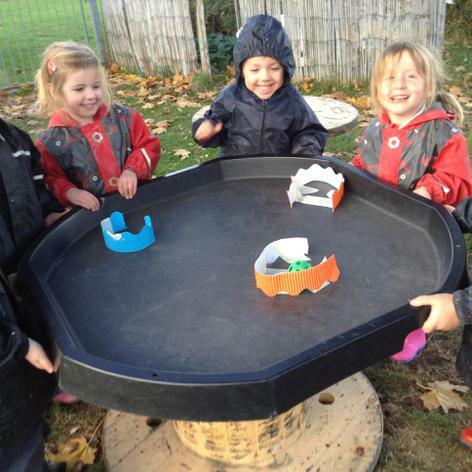 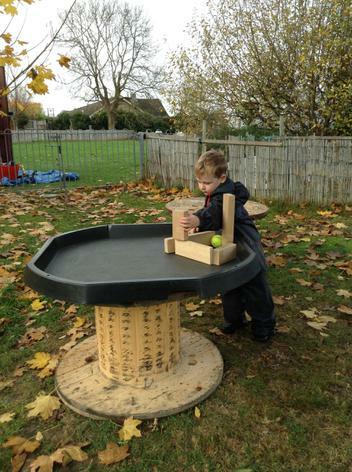 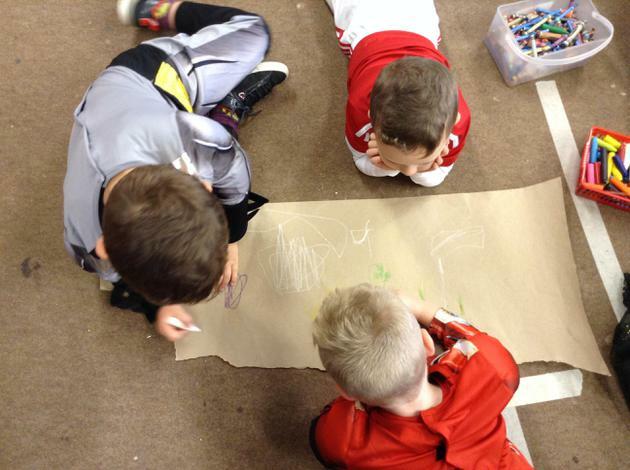 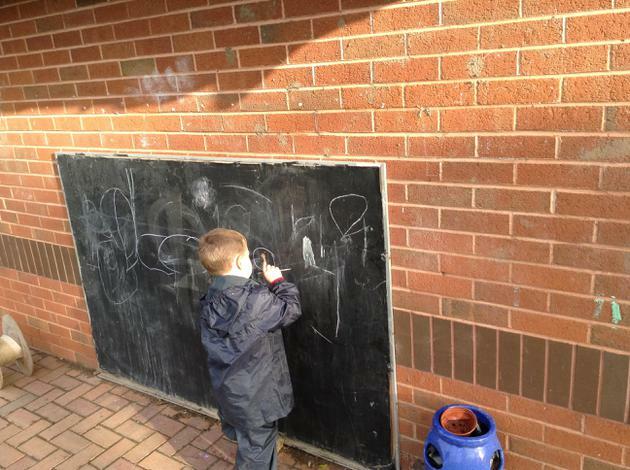 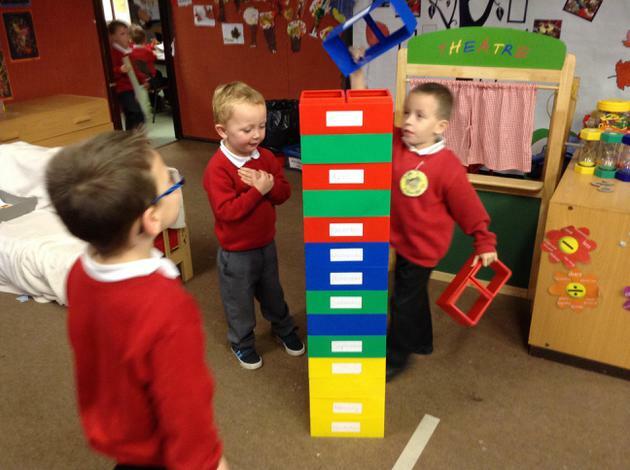 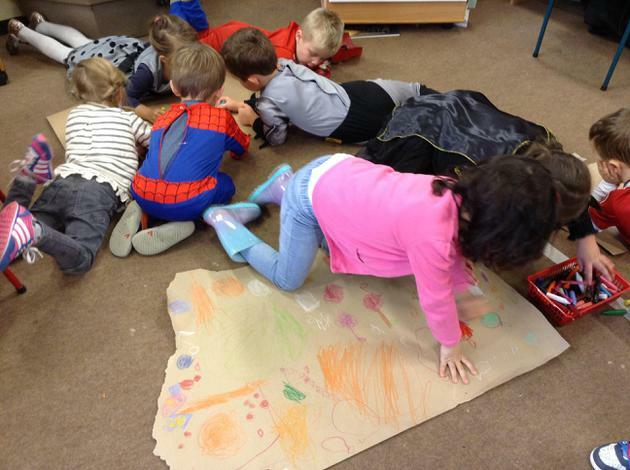 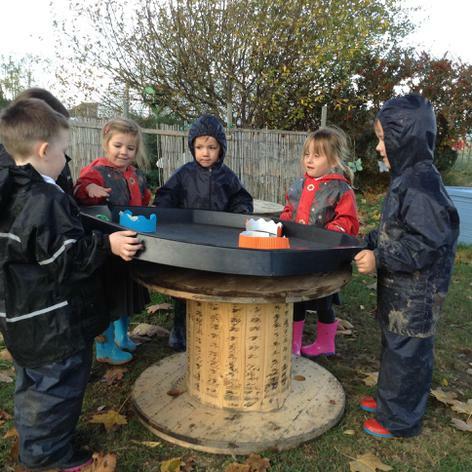 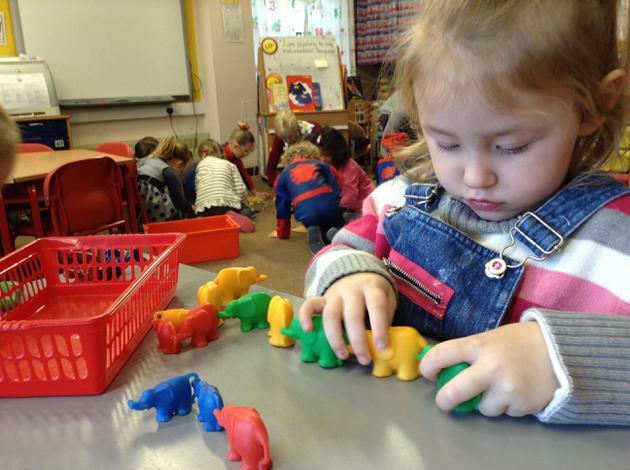 And on top of all that, we have been learning huge amounts and gaining loads of useful social skills during free play. 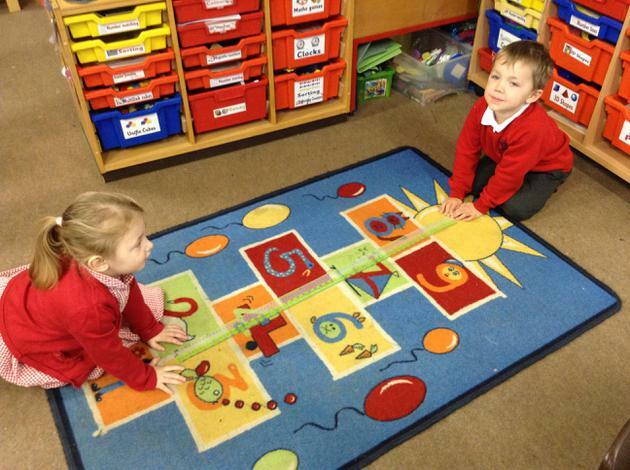 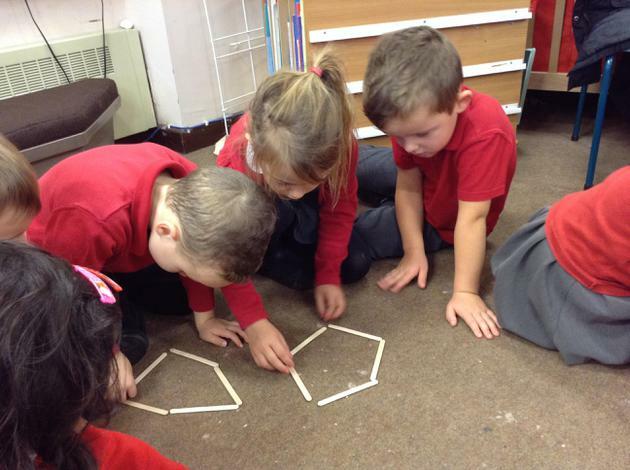 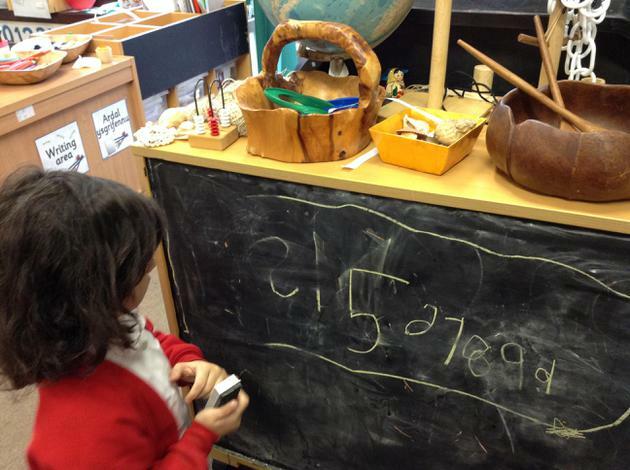 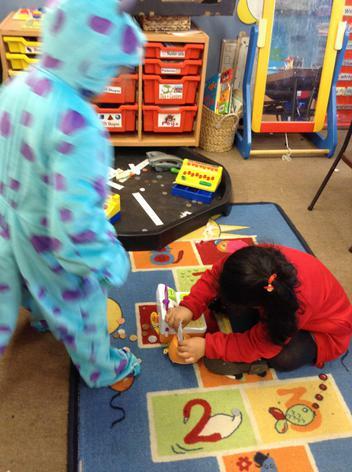 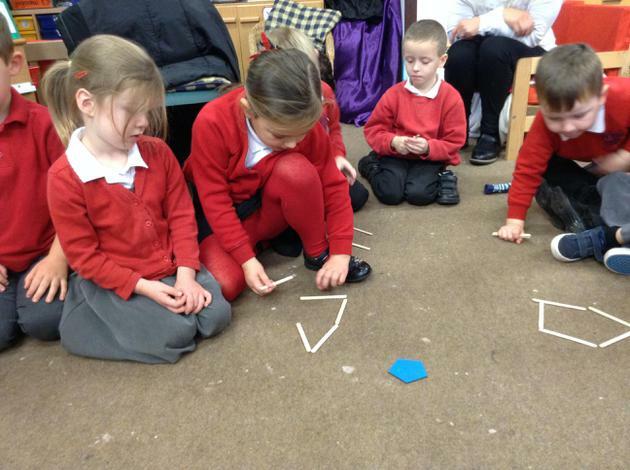 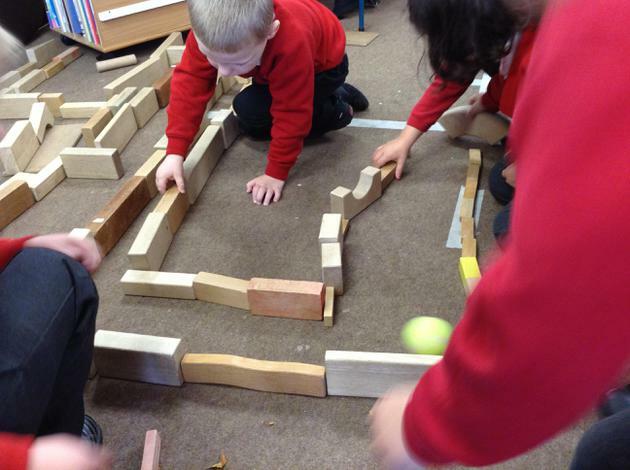 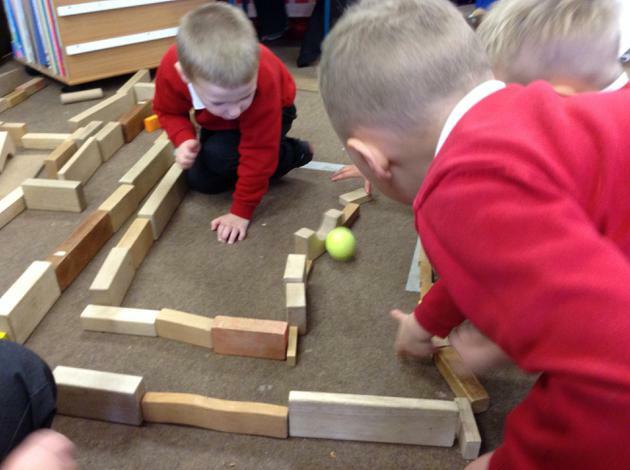 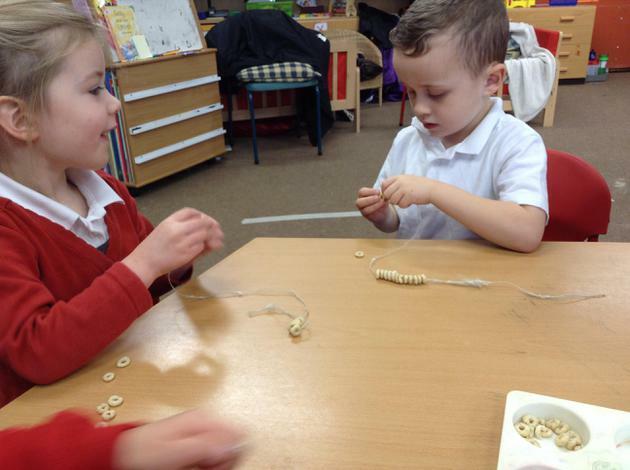 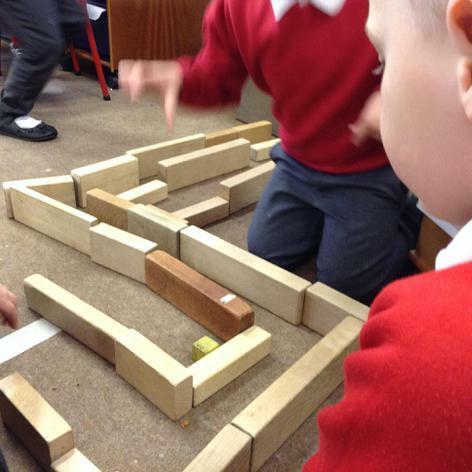 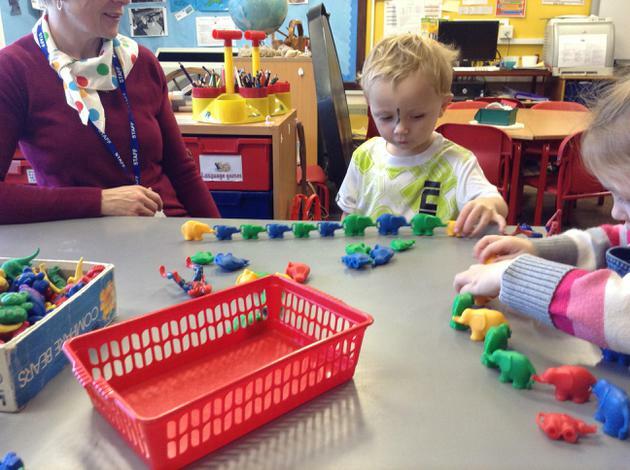 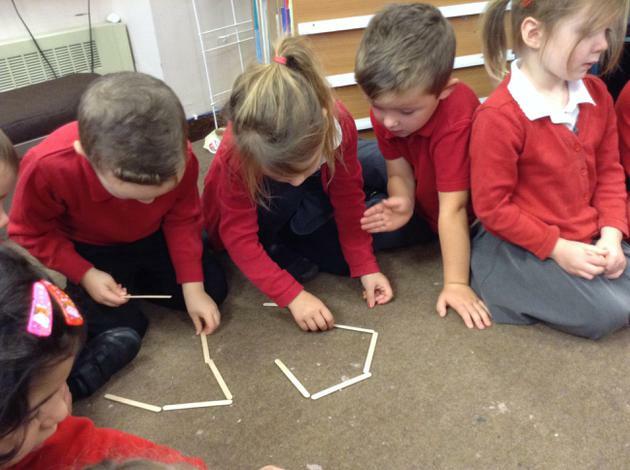 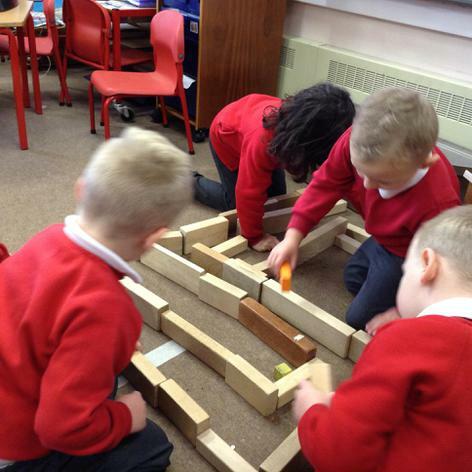 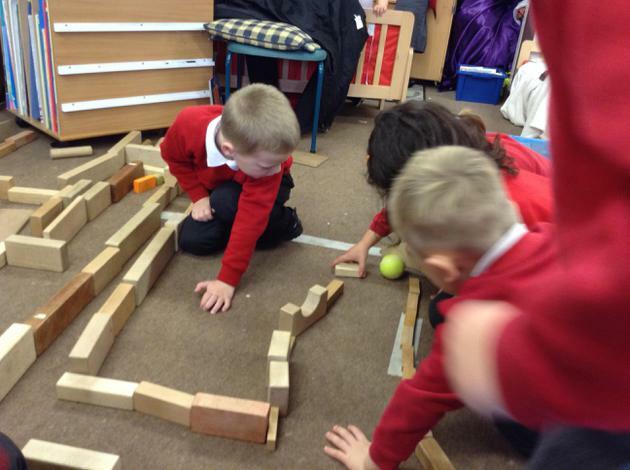 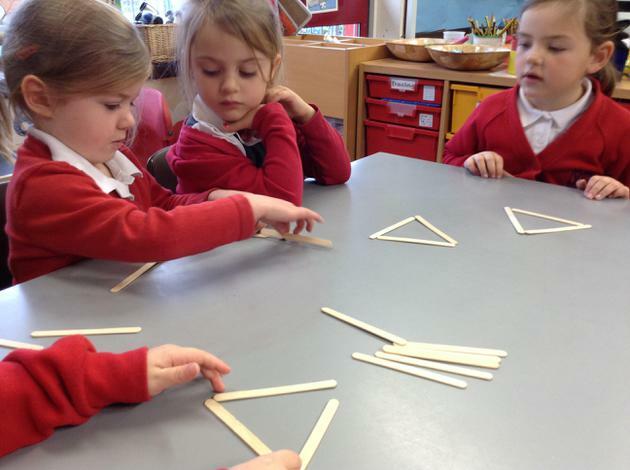 The teachers play alongside us or listen in to our superb conversations. 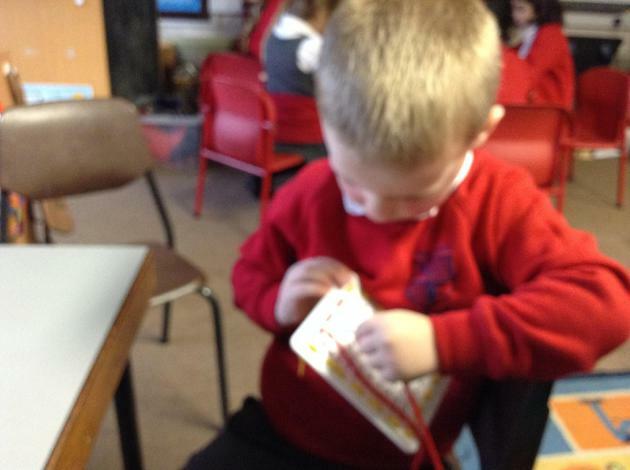 They are obviously very interesting because sometimes they write bits down in a book.